In most racing games, it really stinks when you finish in eighth place. In F-Zero GX, you?re lucky if you place eighth because there are 30 participants in each race! 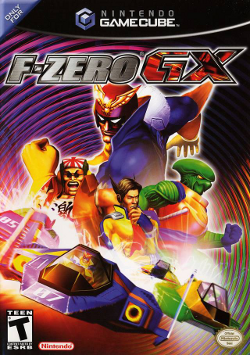 F-Zero GX, the latest installment in the fast paced racing game franchise, is the first F-Zero game on the GameCube. F-Zero GX (referred to as GX hereafter) is developed by Amusement Vision, the same company that developed Super Monkey Ball and Super Monkey Ball 2. Although Nintendo owns the Caption Falcon franchise, Sega published this game, after recently forming an alliance between the software giants. This fact is quite obvious, because the first screen you see in the game displays the Nintendo and Sega logos next to each other. GX offers a wide variety of modes to take part in, such as Story, Grand Prix, Versus, et cetera. Story mode is a new variation of play in which you compete in races, complete objectives, or even knock out certain characters. Each event you participate in is a chapter of the story, which is started and concluded with nicely rendered movies pertaining to the story that is being told. For example, the first chapter shows Captain Falcon taking training, and the objective is to go around a track three times and pick up all of the capsules laying on the track. Once you successfully finish the race, the next chapter is available in the F-Zero shop, where you can buy it in exchange for a few tickets, which are acquired by placing well in the Grand Prix circuits. In the Grand Prix mode, you are faced with a few courses and compete with 29 other racers. GX allows you to compete in Easy, Medium, and Expert modes. The Easy Mode contains known courses such as Mute City, while Medium and Expert modes offer harder courses like Big Blue and Port Town. The higher you rank overall, the more tickets you get at the end of the Prix, which you can use at a store to unlock new pilots, buy parts for your custom ship, or unchain new chapters for Story Mode. Versus mode tells it like it is; versus permits up to four players to compete between each other in split screen mode. As you may know, Nintendo has been slowly releasing games with LAN (Local Area Network) support, allowing many GameCubes to be connected together to play against each other. These games include the highly anticipated Mario Kart Double Dash! !, 1080 Avalanche, and Kirby Air Ride. When I was playing this on multiplayer, I thought this could be even better if it were online supported. Well, it turns out that it isn?t even LAN capable. If it were, I would give GX a higher score for multiplayer. The connectivity between GX and its arcade counterpart F-Zero AX makes up for the lack of online capabilities. If you bring your GameCube memory card to the arcade and use it with AX, you can transfer unlocked characters in the GameCube version to your AX, unearth new parts for custom ships and more. The first time you play F-Zero AX, you will be prompted for your F-Zero license card. If you don?t have one, the machine will print one out for you with your name, license number and your best times. Then you can take your card back home with you, enter your license number into a website and compete for the best times over the internet. The graphical quality of this game is nearly perfect. All of the textures on the ships, tracks, menus, etc. are very, very detailed. The special effects are quite impressive as well, from the scuff marks when you ram into someone else to the sparks flying out from your engine when you boost. The frame rate is excellent as well. The game runs extremely smooth 100% of the time, even with all of the other 29 cars in view. Kudos goes to the Amusement Vision graphical team on this one. F-Zero GX is presented in Dolby Pro Logic II, which is one of the best surround sound classifications available. All of the voice tracks in the cut scenes are well done, as well as the distinct sound each ship makes when whirring around a 180 degree turn at 2,000 KM/hour, for example. And, yes, it really is that fast. As far as inappropriate things go, this is just about as violent as your average NASCAR race. GX is rated Teen for Violence, which is due to ships blowing up, and for Suggestive Themes, because a couple characters have some inappropriate clothing, which really isn?t seen anywhere except in a few of the movies in the more difficult chapters in Story mode. F-Zero GX is a solid addition to the F-Zero franchise. With split timing controls, stunning graphics, and connectivity to AX, this game is a must buy for any fast paced futuristic racer fan.